It is thought that this was taken in 1949/50? Back Row: George Sutherland, Donald Murray, Alex Davidson, Donald Aburrow, Robert Hilary, Kenneth Boyd, Hamish Ross. 3rd Row: George Darling, Stewart Will, Elizabeth Smith, Rose McAllister, Frances Dunnet, Margaret Mitchell, Duncan Mauchlin, Walter Maclean. 2nd Row: Noreen Gunn, Helen Ross, Margaret O'Neill, Violet Morrison, Nancy Hutton, Flora Ross, Jenny Ross, Jean Macrae, Sheena Mackenzie(me). Front Row: Sandy Mackenzie, John Ross, Rossie Gordon, Michael Macpherson, Donald Macleod, Willie Mackay, James Walker. Thanks Sheena, I will be sending them to her. Did you two ever get in touch? If not let me know and I will remind her again..In the picture Michael Macpherson, is the one that was known as "The Black Prince"?..great picture by the way. 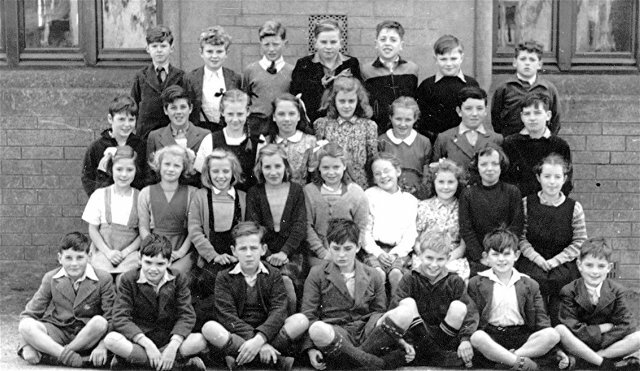 Does anyone hear from Noreen Gunn (2nd row)? She used to live next door to me in Golf View Terrace around the time this photograph was taken. We entered a Fancy Dress Parade in the early 50s as bathing beauties!! I will have to dig out the photographs. Hi Harry, just found two more photos that include your sister, I remember what a lovely singer she was. I think Noreen Gunn moved to Glasgow in the late fifties Anne. I'm glad that you and Harry submit your photos. I've lost a lot of mine in my travels. It's really nice to read your comments. I was at Noreen's wedding reception in Glasgow. I think she moved then to either Australia or New Zealand but she has been in Invergordon in the last 6 or 7 years although I didn't see her myself. I believe she went into the Town Office for some information. Noreen has been in Australia for many years. Her daughter sent me an email as Noreen doesn't have a computer. As this was a wee while ago she might have one now but I don't have her address.